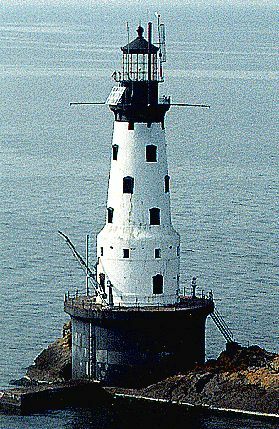 The foundation for Rock of Ages Light was blasted out of a rock ledge at the southwestern end of Isle Royale. Construction was completed in 1908, and the tower was fitted with a temporary Third Order lens which was replaced two years later with a more powerful second-order Fresnel with four bull's eyes, producing a double flash every 10 seconds. That lens was finally removed in 1985 and is now on display in Isle Royale National Park. It took five days and about 600 hours of work to dismantle the huge 8 foot tall lens, which was made of twenty 100lb panels and hundreds of prisms. The current 300mm Lucite lens was installed when the solar panels brought with automation could not rotate the Fresnel. Rock of Ages' 700,000 candlepower light, however, remains the most powerful on the Great Lakes. There are many stories of Lake Superior shipwrecks, One of them involves the George M. Cox, which went aground in a fog near Rock of Ages in 1933 . All 125 passengers and crew were rescued by the light keepers, and they spent the night perched on the tower's spiral stairway.